This guide will assist you with creating your shipping rules set up in a Shipping Table, which will determine your shipping options presented to customers at checkout. You will be able to add a Shipping Policy which is a complete text explanation of your policy and is displayed to customers on the PriceCheck website. The Shipping Table consists of two factors: shipping methods and product classes. 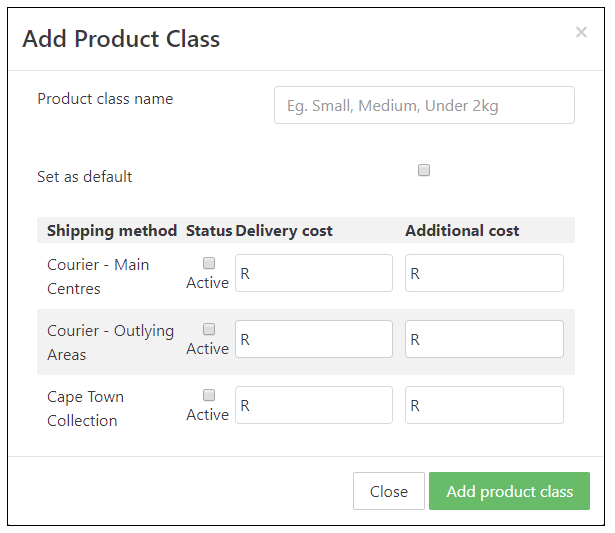 Adding shipping methods, product classes and associating them together create your Shipping Table. Shipping methods are the different delivery options or collection points you offer. Example: South African Post Office, courier delivery, collection points etc. Product classes are used to group similar products together which utilise the same shipping methods. Example: small products, heavy products, products > 5 kg, all products etc. When at least one shipping method and product class are created, you will be able to “activate” the shipping method and set its shipping cost for that particular product class. If multiple products are added to an order you can specify a delivery surcharge rate for increasing the size of the order. If you have created multiple product classes, you will be able to map a product class to your product categories on the Manage Class & Category Mapping page. This product class will override the default and display the shipping methods and costs associated with it. If two products in different product classes are added to one order, the shipping total will be calculated by adding the “delivery cost” of the larger product class plus the “additional cost” of the smaller product class. This is your shop’s shipping policy and will be displayed to customers on the PriceCheck website. It should be written clearly and easy to understand. If you ship to main centres or regional areas you should specify which towns are included in these destinations. If you offer collection points the addresses of these points should be stipulated. The policy is limited to 3000 characters. Main Centres R50 delivered within 1 – 2 working days: Johannesburg, Cape Town, Bloemfontein, Durban, East London, George, Pretoria, Kimberley, Port Elizabeth, Polokwane. Outlying Areas R70 delivered within 2 – 5 working days: Areas not listed above. Click the “Add Shipping Method” button. In the “Shipping method name” field, provide a name for your shipping method. This name is displayed to customers. If free delivery is offered on this shipping method, in the “Free delivery over an order value of” field, set the order amount when free delivery would applied. Check “Enabled” so the shipping method is visible to customers. 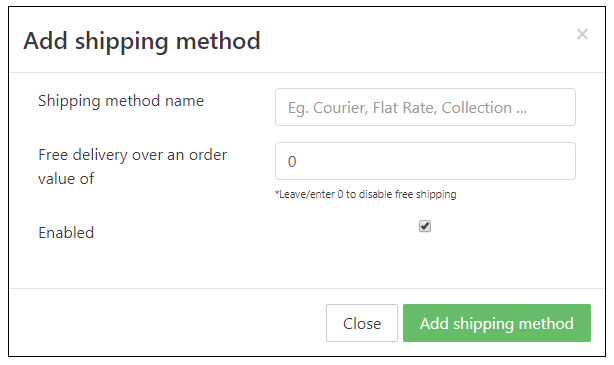 Click “Add Shipping Method” to create your shipping method. The “Add Product class” button will now be available. You can continue adding shipping methods, or create your first product class. In the below example, three shipping methods were created first: Courier – Main Centres, Courier – Outlying Areas and Cape Town Collection, and then the first product class was created. Click the “Add Product class” button. In the “Product class name” field, provide a name for your product class. This is an internal reference. Check “Set as default” to set the product class as the account default. Activate the relevant shipping methods on the product class by checking the “Active” checkbox. Enter the shipping charge for the shipping method in the “delivery cost” field. If there is a surcharge for additional products added to the order, indicate this cost in the “additional cost” field. Click “Add product class” to create your product class. A default product class must be set and will be used as the account default. Your shipping table will be created and will display the rules set up for each product class and shipping method. Continue adding shipping methods and product classes until the rules for your Shipping Table are completed. To edit a shipping method or product class click on its name. “Copy” and “Delete” functions are available when editing either a shipping method or product class. If different product classes are created, you will be able to map these products classes to your product categories which will override the default (refer to Manage class & category mapping). This section displays the default product class rules as determined in your Shipping Table. The order processing time is the amount of time it will take you to prepare an order between when it is placed and when it is ready for collection. This time is calculated as business days. The available options are: 1, 3, 5 or 7 days. This is your shop’s returns policy and will be displayed to customers on the PriceCheck website. It should be written clearly and easy to understand. The policy is limited to 3000 characters. Set the name, email and phone number details of the person who will be processing your PriceCheck Marketplace orders. If your Shipping Table contains multiple product classes you will be able to map these to your product categories. The default product class will be applied to all product categories. Locate the category by searching for the category name at the top of the page, or by navigating through the category pages. 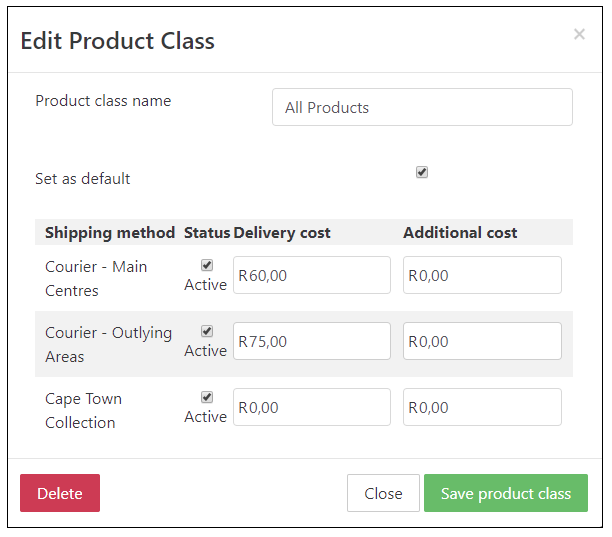 To apply a product class to a single category: From the drop-down box select the product class and click “Save”. To bulk apply a product class to multiple categories: Select the categories on the left-hand side. At the top of the page, from the “select product class for bulk apply” drop-down box, select the product class and click “Apply”. To apply the product class to the category’s children, check this checkbox before clicking Apply.